When I saw this cheesy meme appear on my Facebook news feed the other day, it got me thinking about the nature of this ‘goodness of people’. What compels a person to perform a Good act? What makes someone a Good Person? Is it because there exists some fundamental, irreducible ethical impulse that throbs in our hearts whenever we see an injustice and feel moved to rectify it? Is there some primordial force of moral Goodness within us, that manifests in the world whenever we perform a Good Deed? I don’t know. And when I ask this question, I’m not sure whose answer I trust more- the reasoned formulation of an ethical philosopher like Emmanuel Levinas, or the straightforward, commonsense proclamation of a 6 year old. But regardless, what interests me about this meme is that it cares little for this holy moral spark that supposedly exists in the heart. It concerns itself, instead, with the socially constructed ideal of the Good Person. None of us are saints. Our days are passed, mostly, in the pursuit of tasks that our self-interest places before us. Most of the time we try to get by in the world, while doing the least harm possible. Nonetheless, in some moments, we are compelled by circumstances to do a Good Deed. 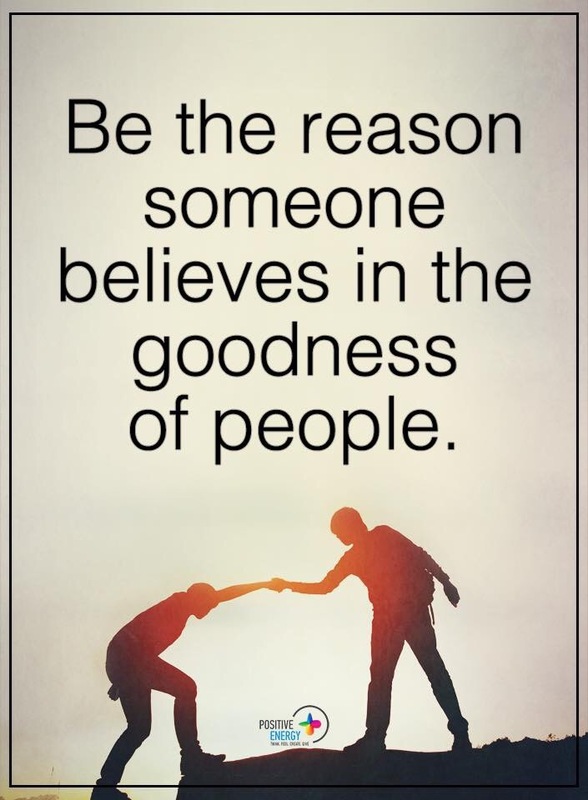 In these moments we try, as the meme says, to ‘be the reason someone believes in the goodness of people’. We try to be a Good Person- that is, we strike the pose, we perform the image of the Good Person before the gaze of the Other. In public, we do good deeds so that others may believe, not only that the Good Person exists, but that we, in fact, are one of these Good People. And even in an anonymous Good Deed, we strive inwardly to embody, before our own gaze, the ideal of the Good Person we wish to become. In this roundabout way, the human race presents and re-presents to and for itself, through the generations, the image of the Good. Each of us strikes a pose of Goodness designed to convince the mass of others, and ourselves, that the Good has not vanished from the world, that we, in this moment of the Good Deed, are the embodied ideal of the Good Person. None of us are saints. Really, we are all flawed, partial beings- we cannot claim that, in all or even most of our moments, we walk the earth with none but the Good on our minds. But like the whispered rumor of an impending Messiah, that, passed from person to person, keeps religious faith alive through the generations, so do human beings strike the pose of the Good, so that another may ‘believe in the goodness of people’- so that the image of the Good may not vanish from this world. The ideal of the Good reveals itself in us in those brief moments- or rather, our actions gesture towards it. In this way the Good, the ethical principle, flits about the human world. It does not exist in and for itself, but rather it is reflected, like a play of mirrors, between humans through gesture, word and deed. We speak of it when we lie down and when we arise; we bear witness to it, together. Like a spark between stones, it appears when our action, driven by our will, strikes the hard surface of given reality. It is that self-evident sensation of justice and righteousness which, when it appears, needs no explanation, though from our different perspectives, each of us offers no shortage of conflicting and competing interpretations as to the shape and form it takes in any given moment, choice or deed. But if the Good is socially constructed in this way, we must then ask- where did this image of the Good originate? Who started the rumor that the Good Person exists? Who implanted the idea of the Good in our hearts? This is Kant’s argument for the existence of God- humans, he said, have manifest access to only partial, incomplete, relative truths in this world. Nonetheless, we find, in our heads, the idea of an absolute, transcendent truth. From where did we get this idea? Surely not from the partial fragments of this world! This ideal of absolute truth must have been gifted to us from a transcendent source that lingers beyond our perception, a hidden source that we, gesturing blindly, call God. Who is a Good Person? One who is convinced that the belief in the existence of the Good must not vanish from this world, one who, therefore, resolves time and again to strike a pose. Author Ben LorberPosted on February 14, 2017 March 27, 2017 Categories ethics, philosophyTags alterity, ethics, Levinas, morality, philosophy, The OtherLeave a comment on Who is a good person?